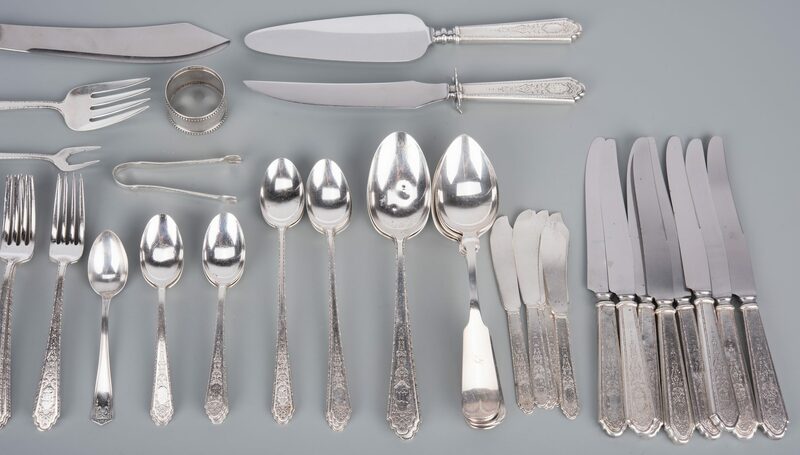 Lunt sterling silver flatware Mary II pattern with serving pieces including 8 knives (9" L), 6 forks (7" L), 8 salad forks, 6 teaspoons, 6 flat handle butter spreaders, 6 round bowl soup spoons (6 1/2" L), 5 iced teaspoons, 2 serving spoons, cake server (10 1/4" L), carving knife (10 1/4" L), cold meat fork, cream ladle, olive/pickle fork, sugar spoon, jelly server, sugar tongs (3 1/2" L). 55 pieces, 46.545 weighable oz troy. 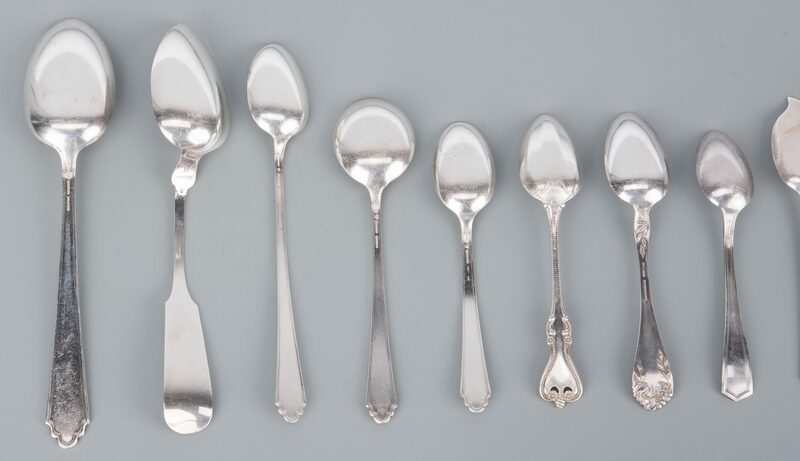 Group also includes 6 Gorham sterling place spoons with fiddle tipt handles, shoulder marked "Lion, Anchor, G, Sterling" and stamped P within a circle. Single monogram, 8-1/4" L, 7.885 oz troy/ set of 6 spoons; plus 4 miscellaneous sterling teaspoons and 1 round sterling nakpin ring, 3.095 oz troy; plus 1 large carving knife with weighted sterling pistol grip handle, marks worn, 10 3/4" L. Total 67 items, 57.525 total weighable oz troy. 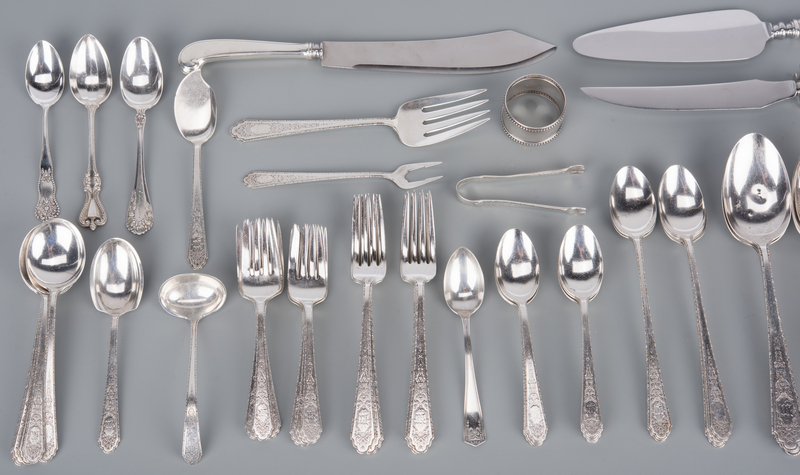 Mary II service, Gorham place spoons, naphin ring and 1 misc. teaspoon monogrammed. Housed in worn wooden storage box. CONDITION: Most items with monograms. Lunt service with dents in 1 handle of dinner knife, 1 dinner knife with loose handle and 1 dinner knife separated in 2 parts. 1 serving spoon with fleabites in bowl. 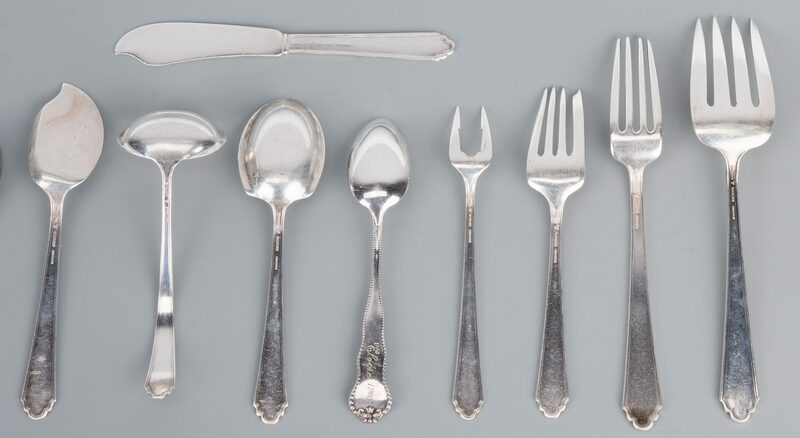 All sterling with some surface wear.